Glenn Irwin (Be Wiser/PBM Ducati) celebrates his victory in the feature race at the Sunflower Trophy meeting at Bishopscourt with runner up Christian Iddon (Tyco BMW) and Danny Buchan (MSS Kawasaki). Imperious Glenn Irwin turned on the style as he dominated Saturday’s JAS Finlay Sunflower Trophy meeting with a sublime treble on the PBM Be Wiser Ducati. The British Superbike rider seized the chance to ride the factory-backed Panigale R in front of his home supporters with both hands, powering home in the blue riband feature race to lift the famous Sunflower Trophy for the first time at Bishopscourt in Co Down. Irwin followed in his father Alan’s footsteps, who clinched the silverware twice in 1982 and 1986, with younger brother Andrew winning both Supersport races on the Gearlink Kawasaki to make it a fantastic five for the Irwin family. The eagerly-awaited Sunflower showdown was re-started over six laps following a red flag and although Christian Iddon took an early lead on the Tyco BMW, Irwin assumed control at the beginning of lap two and was never headed. He controlled the race to win by 0.386 seconds from his fellow British Superbike rival, with Danny Buchan having to settle for third on the MSS Kawasaki as the Essex man’s bid for a third successive triumph floundered. 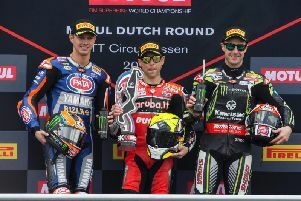 Pole man Irwin, who will now turn his attention to his debut at the Macau Grand Prix next month on Paul Bird’s Ducati, said: “That’s the one I wanted and it’s nice to have finally done it. I’m a little bit disappointed with the way I won the race because we changed tyres for the re-start on the grid but Christian didn’t have one. “It’s taken a little bit of the shine off the win but it’s been a great event. I would have loved to have gone even quicker, but we went as quick as we needed to and I always felt in control,” added the 26-year-old. Stockport rider Iddon had the consolation of setting a new lap record at 100.676mph, which was slightly slowed than Irwin managed during practice when the Ulsterman lapped at 100.685mph. “I’ve really enjoyed the Sunflower event and my debut at Bishopscourt. I desperately wanted to bring the trophy home for the Tyco BMW team,” said Iddon. Buchan was never able to land a blow as he circulated in third place and was left to rue a lack of top-end speed on the MSS Kawasaki. Behind the top three, Nikki Coates (KP Kawasaki), Andrew Irwin on the 600cc Gearlink Kawasaki and Robert English (IFS Yamaha) filled the first six positions in the headline race. Prior to the red flag in the original race, scheduled for 12 laps, Irwin and Iddon traded blows in a thrilling spectacle. English raider Iddon had taken the lead on lap six with a stunning move at Ringawaddy, although Irwin had nosed ahead again at the beginning of lap seven when the race was halted. Castledawson’s Nico Mawhinney, who qualified on the front row in fourth place, was a faller on the warm-up lap on his Team Polaris Kawasaki, while Gearlink Kawasaki’s James East also crashed out.